No matter how good anyone is at lying, the face always gives it away in subtle ways. The science behind body language, particularly when it comes to lying, can be complicated. But there are those verbal cues that ordinary people can use to tell when a spouse, friend, partner or relative is feeding them with a junk loading of lies. In the body language of lying, fidgeting is a major sign. This more so applies to truthful people who know they are lying. According to Bella DePaulo, a body language expert, liars can tell a lie within minimal fidgeting if any at all. Nonetheless, you should watch out for this body language cue when you’re talking out something with someone close to you. When someone feels uncomfortable or trapped by questions that they wish they didn’t have to answer, they’ll have their eyes darting back and forth. This is just the same as you’d do if you found yourself in a dangerous situation, trying to look for an escape route. Rapid blinking is also another telltale body language sign that someone is lying. Typically, an average person blinks about 5 or 6 times each minute. However, when under stress (such as when they know they’re lying) this can go up to 30 times a minute. When people authentically smile, the skin around the eyes bunches and wrinkles. But when the smile is false, it’s just done with the mouth and you won’t see any change in the eyes. This can help you figure out whether someone is just trying to be nice while in fact, they wish you weren’t there talking to them. When you ask someone a question and get nothing, but then (after a delay) they begin to respond, this might be a telltale body language sign that they’re lying. An exception to this could be when you’re asking a question that needs thinking. For instance, if you ask your best friend where they were on the same day five years ago, they’ll most likely pause and try to remember. But if you ask them whether they robbed a groceries store on this day five years ago, and they pause to think, then you probably need to pick your friends more wisely. It all depends on the context. Naturally, the brain is wired in such a way that it matches verbal and nonverbal behaviors. So when there’s a disconnect, this might be a surefire sign that someone is telling a lie. A common disconnect is when someone nods affirmatively but says no. Or when they turn their head from one side to the other while saying ‘Yes’. However, keep in mind that this verbal/non-verbal disconnect only applies when there’s a narrative response, not short-phrased responses. Just like a person who’s lying will dart eyes and try to hide them, they also tend to hide their mouth. Naturally, people want to cover over a lie. So if someone’s hand goes in front of their mouth just when they’re responding to something, this is something you should definitely take note of. 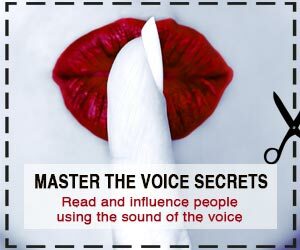 Want to catch those liars, get started mastering body language! Read our first article on body language mastery here!